Eclipse is one smart cookie! 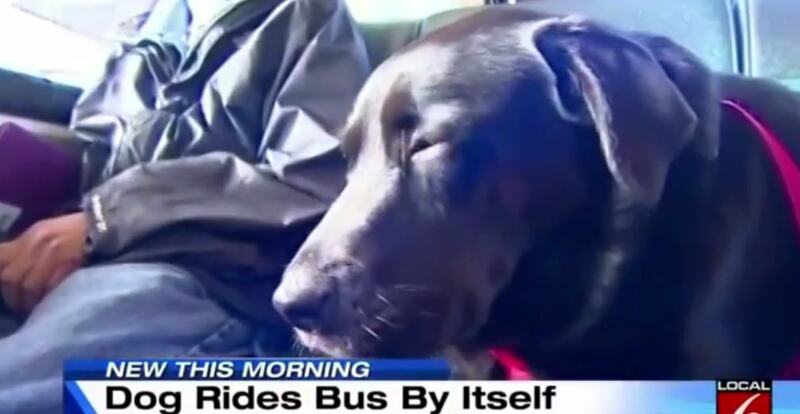 This dog knows how to take public transportation to and from the local dog park! How amazing is this? Eclipse here is from Seattle, and is one amazing dog. Eclipse has learned to ride a bus both to and from the local dog park, daily. She knows exactly where to be and seemingly exactly when to be there to catch the bus. Now that is one smart dog! Kinda Sad…..no one to take her to the park. Latch-key puppy. my first thoughts as well.. this is just sad. How amazing is that? What a smart and beautiful dog!! Lab. Nearly human without the flaws. Apparently shes so eager that she sometimes gets on the bus without her owner and off at the dog park – her owner catches the next bus and meets her. if you watch the video, you will see that the headline is very misleading. her owner is there with her, but if he is smoking when the bus comes, she will jump on without him. GS Ta Vany Luswanto Erisca Wiraatmadja omg! This is just more evidence that animals should be afforded a lot more legal rights and the penalties for cruelty to animals should more closely resemble the penalties for cruelty to children. I mean come on, shes even obeying the law going to the dog park! ABSOLUTELY DISGUSTING…..that any owner would let their dog wander the streets alone! If you actually watch the video, and don’t just read the headline you’d see that she isn’t alone. She’s just a very excited pup for the park so she hops on before her owner sometimes. Read the story. It is very cute. Well the owner goes with her but has a smoke a bud stop. I guess he finishes the smoke and the jumped on the bus. He met her later at the park. The disgusting part is her dad had to have his smoke. She wasn’t exactly wandering the streets alone! Smart dog. Cute story. Hmmmm. ?the bus drivers on Capitol Hill, did not allow me and my very well behaved Service Tzu to ride the bus in Downtown Seattle. I’m really happy they have rethought this~ I hope it is throughout the bus system in Seattle. So is the owner just lazy or what? I’m glad her owner is with her. Be sad if he wasn’t. Dominique Lipscomb we got a long way to go before oscar and ollie get to this level of awesomeness. I’d be so happy if I rode a bus and a dog got on. Bet she makes a lot of people’s days. Dogs rock. Juan is Bruce this smart? Not really safe for the dog. Smart dog but she cannot protect her self from some one stealing her or worse. Kara Brianne Ross, Shawn Ross. This is so adorable!! Guess there is no leash law. Smart dog but not safe- I’d never let my fur babies go out on their own. Is there no owner? April Custodia ngaa ka ma cute kag alam sa ila ah…. She clearly has important places to be and important dogs to talk to. No way! LOL. So adorable and smart. If she does this every day at the same times, I’m sure there are trustworthy people she’s gotten to know that wouldn’t let anyone take her. Joyce McAndrews do you know this story????? So cool, but I would be worried about her if she was mine. I bet people hope she sits next to them. How many lives does she brighten every day? How many conversations at home and work start with, “Guess who rode the bus with me today?” What an angel. I hope her travels are safe. Her owner is usually is with her. If he takes too long and the bus comes she gets on by herself and waits for him when she gets off. Amazing dog but this could turn out so bad. Please keep a close eye on this amazing dog. We cant lose her. Adam Peterson, do you think we could teach Enzo this? Smart baby but sad that her humans can’t or won’t make time to go with her. I hope this dog remains safe and no harm comes to her. I wonder how much the owner cares about her. I wonder if no one reads beyond headlines anymore. How does she pay the fare? What a smart dog she is.